You probably don’t really want to go back to the pioneer days filled with disease, famine and long travel. 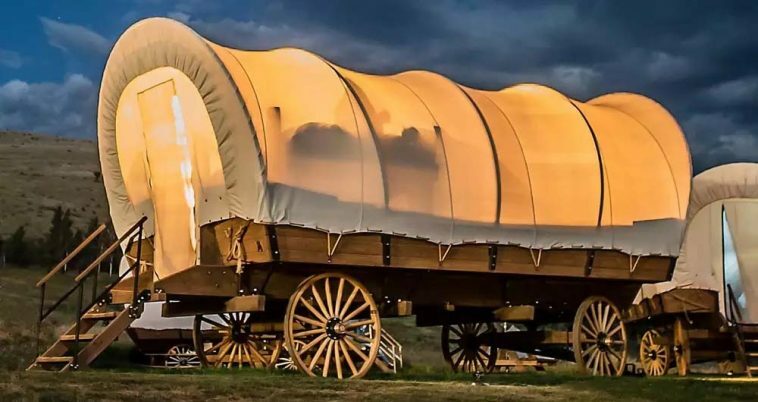 However, if you love the covered wagons they used to ride around in and want a new camping experience, now you can sleep in a covered wagon for fun. 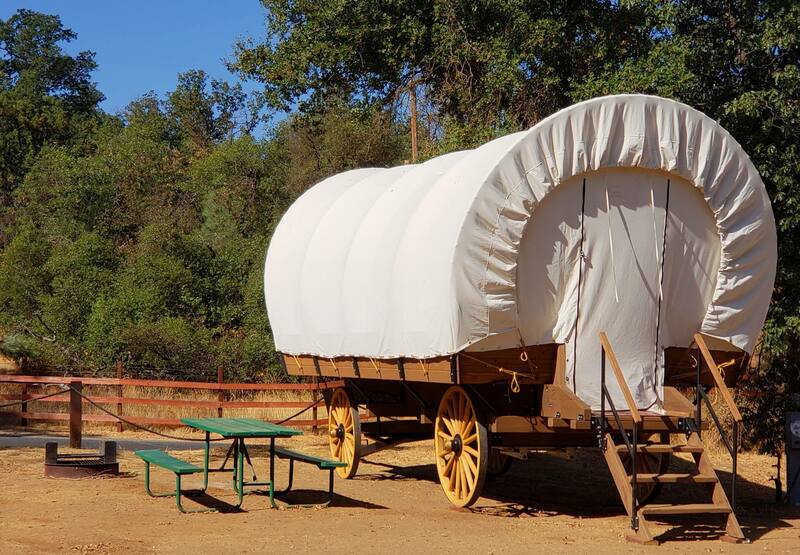 Near Yosemite National Park, you can rent a covered wagon sleeping cabin at Yosemite Pines RV Resort and Family Lodging. 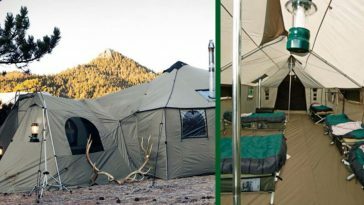 It looks very similar to “glamping” or glam camping… basically many amenities of home, but still the fun of being in the wilderness. If you or your children ever used to play the game Oregon Trail, you might remember these covered wagons in the game. They look just like ox-pulled covered carts on wheels. 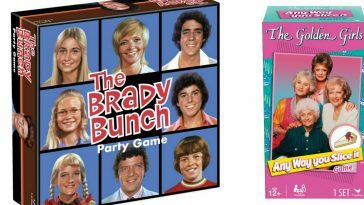 The inside is completely different though and you don’t have to worry about your oxen dying or getting yellow fever like in the game. 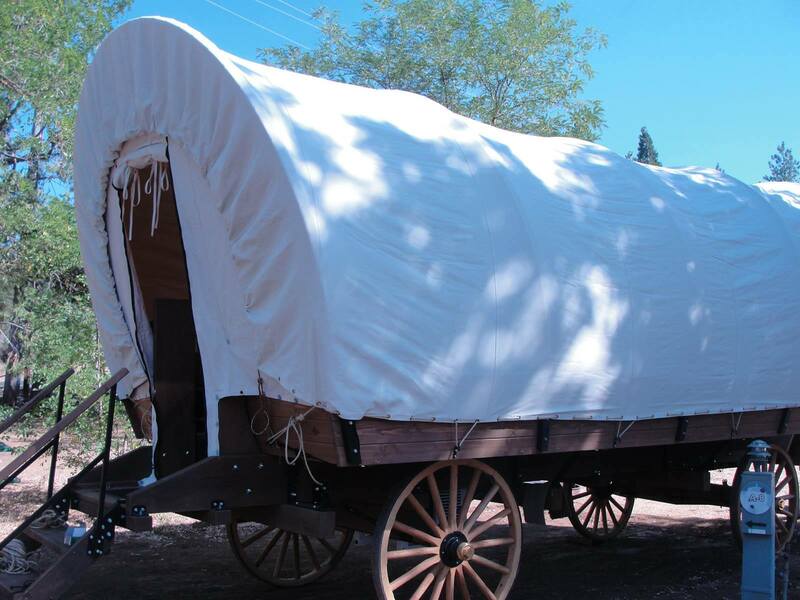 There are six wagons available to rent and each one can sleep between four and six people. There is a king-sized bed, bunk beds, and a small dining area. They all have heat, air conditioning, a microwave, a refrigerator, and even a Keurig coffee maker for your coffee fix. All of these wagons have an outdoor area with a picnic table and a grill, much like many campsites these days. 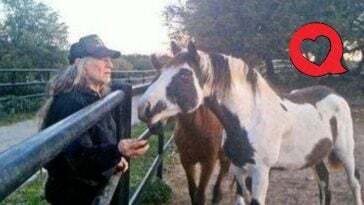 It would be a great place to take kids because not only are you right by Yosemite, but there is a swimming pool, volleyball courts, a petting farm, and other fun activities nearby in the campground. 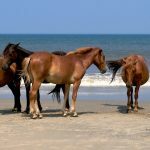 If you want to rent one, they cost between $139 and $279 per night, depending on what season. Obviously, summer months tend to run higher in price. If you are interested in booking, click here. They also offer cool campers and Airstreams to rent as well. 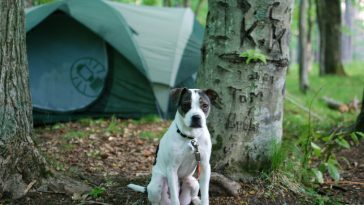 It is an RV park so you can also bring your own camper or RV or just pitch up a tent for the night. If you are ready to start your pioneer fantasy vacation, check it out! 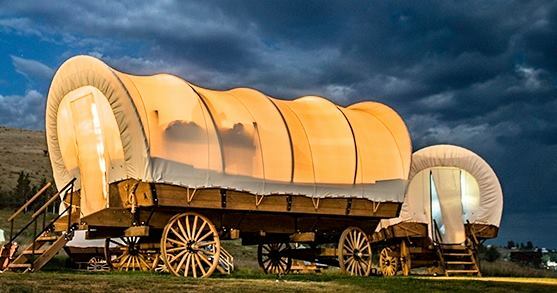 Bonus points if you decide to dress and eat like pioneers while you are vacationing in these wagons. But, we don’t blame you if you don’t! 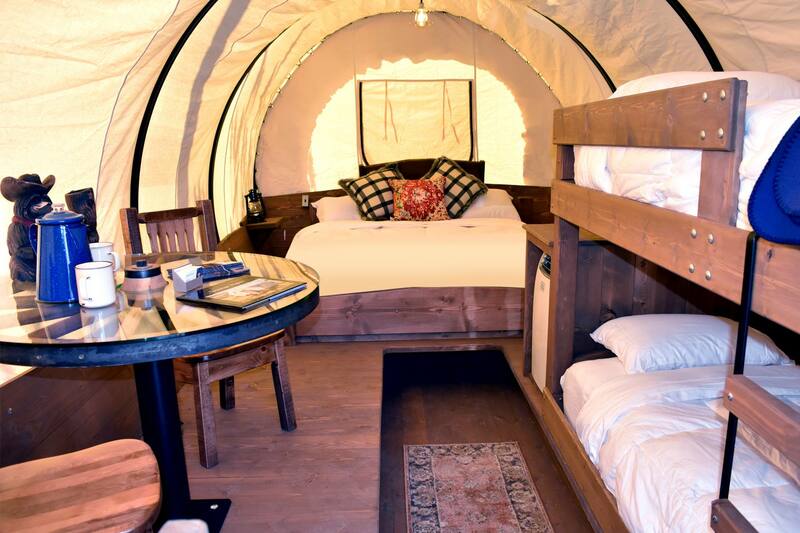 Would you want to stay in a covered wagon for the night? Do you think it would be fun to take kids along and teach them about the pioneer days? Or would you never want to do this? If you enjoyed this article, please SHARE with your friends who love to go camping or used to love playing the Oregon Trail game!